As we return to the history of PHW this week, we turn to PHW’s largest preservation activity of the late 1980s into the early 2000s – the Kurtz Building at the corner of Cameron and Boscawen Streets. The Kurtz Building was built by a group of businessmen from Harper’s Ferry to house grain before shipping it by railroad to the mills circa 1836. (1) The lot, advantageously situated at the heart of Winchester’s commercial downtown, was purchased from the Conrad family, who owned the adjoining (and now razed) Conrad House. By 1846, Robert Conrad repurchased the property and leased the building to various commercial enterprises for the next thirty years. 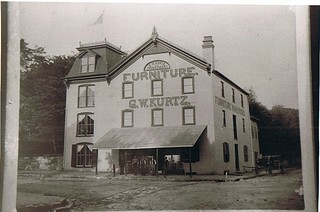 In 1877, Captain George Washington Kurtz(2) purchased the building and it became the seat of his furniture, undertaking, and embalming business. The Kurtz Building, as 2 N. Cameron has come to be known, was expanded several times. The most visible expansion is the circa 1880 Second Empire style tower addition to the north, said to be used for the funerary functions. Several additions were made to the rear in the 1920s and 1940s. 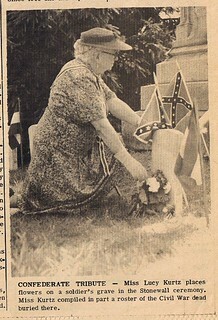 Lucy Kurtz, the daughter of George Kurtz, assumed the family business in 1926. The furniture business was gradually phased out at this point, leaving only the funerary services until the business was finally closed in 1968, after 100 years of operation by the Kurtz family. 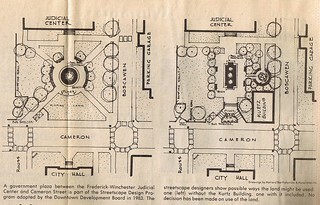 (3) In 1968, she sold the Kurtz Building to the City of Winchester. Afterward, the space was used by physicians and the Chamber of Commerce, and briefly the county judges occupied the space during the construction of the Joint Judicial Center behind the Kurtz Building. The fear had always been in the back of people’s minds since the demolition of the Conrad House in 1970 that the Kurtz Building would likely suffer the same fate once there was no other use for the space. After the completion of the Joint Judicial Center, Winchester City and Frederick County had tentatively agreed to install a plaza in the space between Rouss City Hall and the Joint Judicial Center. Designs for this plaza were drawn up in 1984. One of those plans called for the demolition of the Kurtz Building.